REBIRTH is a 4K timelapse film that I released during the summer of 2018. This blog series highlights a few behind-the-scenes details about locations and the process of making the film. Read this one or skip to to parts 1, 2 or 4! That day I set out for the east coast and planned to capture footage for my REBIRTH timelapse film. As luck would have it, the main route was closed due to road works at Antrim. Of course not! I decided to take the alternative route through Warner village and I’m very happy I did. It was a bright day – maybe too bright – and I hadn’t visited that area in some time. So I was very pleased to come upon such amazing mountain views. The red mark on the map is Warner. 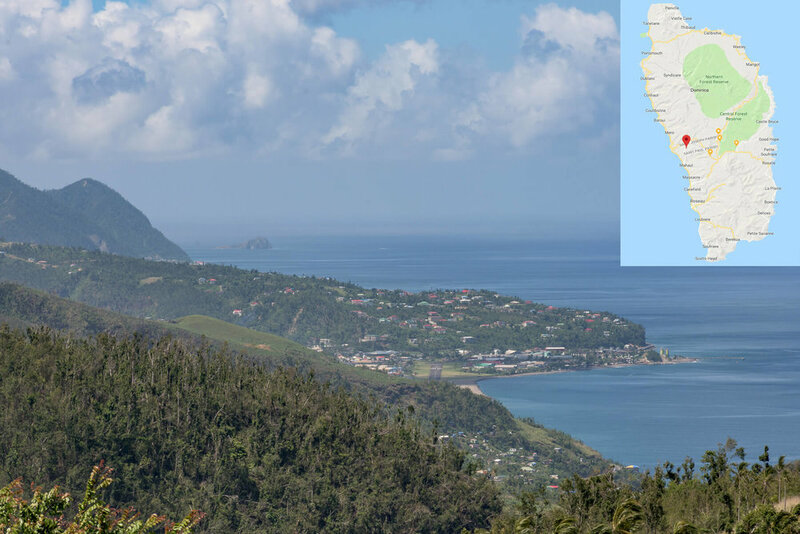 The village is approximately halfway up the west coast, but you’re able to see Dominica’s southernmost point! Something really stood out to me as I parked and exited the vehicle to take in the view. You could see all the way down to Cachacrou (the tip of Scotts Head), even though you’re basically halfway up the west coast. I’m not sure many of easily accessible locations afford such a wide-reaching view! Do you know any other locations with similar views? Vast and wide? Tell me with a comment! Emerald Pool is one of the most popular natural sites in Dominica, second only to Trafalgar Falls. While it’s not as near to Roseau as Trafalgar, the complete immersion into the rain forest makes up for it. I thought twice about making this stop though, since it had rained heavily the night before. Heavy rain usually meant brownish water in the pool, rather than the clear or turquoise blue that Emerald Pool is well known for. This is the scene I encountered at Emerald Pool. Still beautiful, but not as awe-inspiring as I would have liked. As predicted, the water was unappealing and I didn’t shoot any timelapse sequences that day. What was funny to me though, is that my timing for Emerald Pool had been off, not just once, but twice! Several months before, while working on my first timelapse film, I ventured out to the site and I couldn’t have picked a worse day. In three words: too many tourists! The vendors made a killing that day though, and I was happy for that. I had heard about the scenic views from Horseback Ridge but had never been there myself. The road links three hamlets (Salybia, Bataca and Concord) and allows travelers to get in and out of Kalinago Territory in quick time. Hailed as having great economic impact for the nearby communities, the Horseback Ridge road links farmers to their agricultural land and makes travel much easier than it had been in decades past. My first visit was just a scouting mission and I arrived too late in the day to capture any meaningful footage.